Three days ago, my husband attended a memorial service for the father of our dear friend. Yesterday we attended a wedding for the daughter of dear friends. Today we will attend a memorial service for another dear friend. I believe that our capability to feel is part of how we are made in the image of God. Scripture tells us that God loves, God grieves, God gets angry, God has compassion. And I believe He loves us not only with His perfect will and commitment through the gift of Jesus for salvation, but He loves us deeply and passionately. This came to me clearly yesterday, as I watched the emotions play across the face of the groom, music building to that perfect climax when those huge barn doors opened in the back and he saw his bride for the first time that day. Everyone in attendance felt that anticipation, swelling up inside us all and making us tear up. As I watched the bride come down the aisle with her father, I was overcome with the knowledge that in the same way, Jesus waits for His bride to enter heaven, carried on the arms of His sweet Spirit, to stand before the Father and claim us for His own. Do we not think that those who have already gone are not lining the hallways of heaven, rejoicing with each member of the bride as they make their way down the aisle to meet Jesus? Today we will sit with our brothers and sisters and speak of a wonderful man who loved Jesus and loved his family, and celebrate His home-going. I believe Jesus waited in anticipation for the doors of heaven to open and at just the right moment, that perfect note in the song of his life, the doors opened, and our dear brother saw Jesus, waiting for him. In that moment, all other relationships he had experienced in this life became secondary, as he met His Creator face to face. One day we will all step through those doors. I pray two things for myself and for you. I pray that we will have loved Jesus well beforethe wedding…that we are presented to Christ as faithful, pure, chaste, committed bride. I want heaven to rejoice when I go home. I want to stand before Jesus pure and holy, like our precious friend John, and so many others who have already made that walk. I want to be ready for Him. 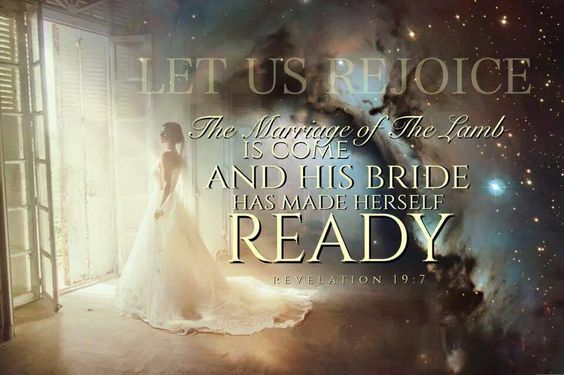 Just as the bride spent all day preparing to see her groom, let our lives be spent in preparation for our heavenly wedding. The second thing I pray is for those who are left to grieve. The parents of this sweet girl who married yesterday went home to an empty nest. Their lives won’t be the same again. They have moved from one stage of life to another. In the same way, when God calls a member of His bride home, it changes the life of the ones left to grieve. I pray that the path we walk will not be hard and rocky ground, lined by our enemy with weeds of disappointment, anger, sadness or any other challenge that will cause us to stumble in doubt, or despair. I pray that instead the legacy of faithfulness, loyalty, love and determination left behind will continue to be the fertile soil that brings forth encouragement for even more fruitfulness in our own lives, fruit of loving and serving Jesus until we too, get to walk down that aisle and meet Him face to face. There’s joy…and there’s grief. But then there’s joy again. Keepin’ the faith in all the crazy! The Armor of God: Put on the Helmet of the Hope of Salvation!